Eurostar is a high-speed railway service connecting London with Paris and Brussels. 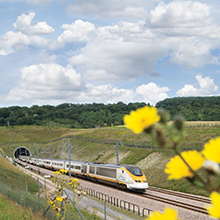 All its trains traverse the Channel Tunnel between theUnited Kingdom and France. The London terminus is St Pancras International, with the other British calling points being Ebbsfleet International and Ashford International in Kent. Calling points in France are Calais-Fréthun and Lille-Europe, with trains to Paris terminating at Gare du Nord. Trains to Belgium terminate at Midi/Zuid station in Brussels. In addition, there are limited services from London to Disneyland Paris at Marne-la-Vallée – Chessy, and to seasonal destinations in southern France in summer and the Alps in winter. The service is operated by eighteen-coach Class 373/1 trains which run at up to 300 kilometres per hour (186 mph) on a network of high-speed lines. The French and Belgian parts of the network are shared with Paris–Brussels Thalys services and also with TGV trains. Food is available in all classes of travel. In Standard Class Eurostar have teamed up with the UK’s popular supermarket, Waitrose, to provide you with excellent quality and delicious snack and meals from the buffet. In Standard Premier the staff will happily serve you your meals at your seat and you are able to pre-order these meals when making your booking if desired. It is also possible, in this class, to order child-friendly meals and meals that cater to specific dietary requirements. The meals in Business Premier have been designed alongside Eurostar’s culinary director, Raymond Blanc and offer the most delicious and enjoyable meals allowing you to make the most of your time on board.